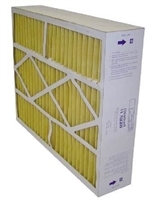 Our Goodman box filters have MERV ratings of 11 to 14. 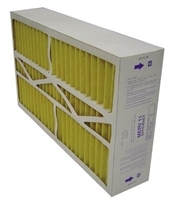 MERV 11 filters can remove household particles down to 0.3 micron, particle sizes that include dust, dust mites, insecticides, pollen, mold, some fungi, pet dander and auto emissions. MERV 14 filters trap all of these particles very effectively and, in addition, filter out smoke from fires, stoves and cigarettes, as well as smog and most bacteria. Deep pleat box filters for Goodman trap more particles and hold more dirt than other filters! Because of their extended surface area, these filters will last 6-12 months before you'll have to replace them. Five-inch replacement air filters work for Goodman, Amana, some Five Seasons and some Clean Comfort systems. If you're not sure which deep box Goodman furnace filter you need, or whether you need another type of filter altogether, please contact us. We are here to help!